Malawian Airlines has today announced that it will start flights to Dar es Salaam come March 8, 2014. The inaugural flight will be on the Bombardier Q400 NG. The airlines started its flights on 31st January 2014 and services both domestic and regional routes. 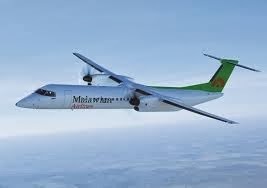 Malawian Airlines' fleet is made of two planes, a Boeing B737-800 and a Bombadier Q400 NG. Both these planes were delivered to the airline from its strategic partner Ethiopian Airlines. The new generation Boeing 737-800 airplane, which is less than two years old in operation, has two-class configuration of business and economy with a capacity of 154 passengers. The Bombardier Q400 has the capacity of carrying up to 67 passengers. Malawian Airlines Limited is the flag carrier airline of Malawi based in Lilongwe with its hub at Lilongwe International Airport. It was established in 2012 after the liquidation of Air Malawi, the former national airline. Ethiopian Airlines operates it under a management contract and owns 49% of the airline after it emerged as the winner following competitive bidding.